The Rio Grande with Cochiti Dam rising above it on the Cochiti reservation in New Mexico. Driving back from Santa Fe recently, I took the long way home. Frequently, I write about water and drought, and it’s helpful to actually look at the Rio Grande and its reservoirs on a regular basis. Pulling off I-25, I headed toward the Pueblo of Cochiti. As I crossed the Rio Grande, the view ahead yielded an enormous dam rising alongside the road. 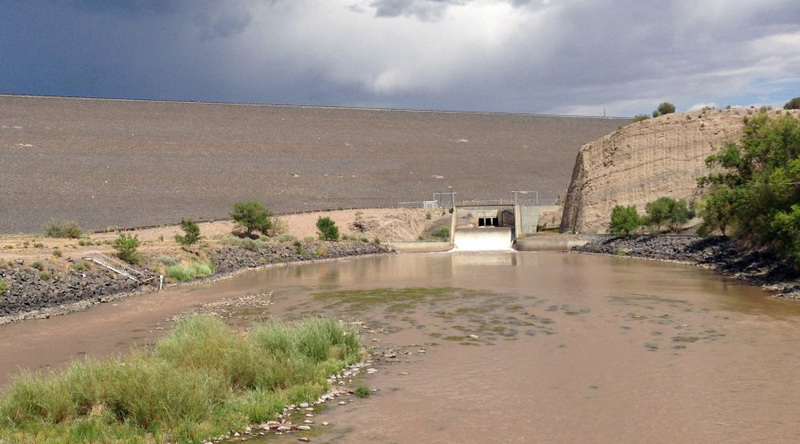 Cochiti Dam is one of the 10 largest earthen dams in the United States. It contains more than 65 million cubic feet of earth and rock, stretches more than five miles across, and rises about 250 feet above the Rio Grande. Driving past the dam on my way to check out the reservoir’s waters I was reminded of a talk the Pueblo of Cochiti’s Regis Pecos gave a few years ago. Read Regis Pecos’ talk on the creation of Cochiti Dam here. Caught up in the fray of drought and the politics of water — managers today have to balance the needs of cities, farmers and endangered species that depend on the river’s water — it’s convenient to overlook how the current system irrevocably changed the relationship Native communities had with the Rio Grande. Cochiti is just one of the tribes in the Middle Rio Grande that has been affected by more than a century of federal dam-building and river-tinkering. Congress authorized construction of the dam as part of the Flood Control Act of 1960, and over opposition from many tribal members, the U.S. Army Corps of Engineers built Cochiti Reservoir between 1965 and 1975. The lake inundated sacred lands as well as fields the tribe had tended for centuries. The tribe was able to block the development plans. In the 1980s, it acquired the town and in the 1990s it created the Cochiti Community Development Corporation. According to the town’s website, it today hosts about 400 residents. In recent decades, the Army Corps of Engineers and the tribal government have come to terms with their shared history over the dam, and are trying to understand more about the impacts the dam has had on the pueblo. The day I visited, flashing thunderheads built north of the lake. A few boats headed toward the shore. Perhaps it was just the coming storm affecting my mood. But this place felt as though it’s experiencing yet another transition. New Mexico is in its third year of drought and the Rio Grande’s flows are low. Debris laps against the shore and the lake is muddy with sediment. Stripped of stable vegetation, the burn scars from fires to the north — including the Las Conchas fire two years ago — can’t hold the topsoil down. Summer monsoons are cause for celebration. But the heavy rains slalom mud down the slopes; the sediment clogs canyons that drain into the Rio Grande and the reservoir. History is always shifting; this time, the climate is changing, too. By writing this, I’m not trying to dredge up bad feelings or painful histories. But those of us downstream should know something of the history held behind that earthen wall.